Dr. Matthew Harrison has an energetic passion for helping patients see the world clearly. Dr. Harrison’s commitment to his patients is to provide excellence in eye care by ongoing professional education and by using the latest technology. One of Dr. Harrison’s areas of special interest includes refractive eye surgery and the visual rehabilitation of head injury patients. Dr. Harrison has personally been enjoying the benefits of LASIK surgery since 2012 and is an affiliate of TLC Vision Centers. Dr. Harrison feels passionately about giving back to the community. He actively participates in community service programs and in charitable organizations such as the Paris Kiwanis Club and is a provider for the Eye See Eye Learn Program. Dr. Harrison is also involved in humanitarian optometry missions (most recently in Peru) providing eye exams, treating ocular disease and distributing glasses to people in need. When he is not helping patients, Dr. Harrison enjoys spending time with his wife Christina, playing golf, travelling and all things hockey. 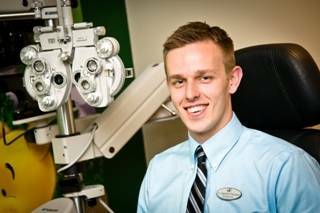 All of these things combine to make Dr. Matthew Harrison a compassionate and hardworking eyecare professional. He loves his chosen profession and continually strives to provide excellent eye care to his patients with integrity and kindness.